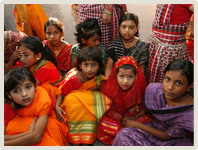 The Sreepur Village - Women's and children's stories. Sreepur Village gives hope and opportunity to over 500 abandoned children and more than 100 destitute women who have come to the Village from all over Bangladesh. They find their way through a variety of NGO 's and government organisations who refer these desperate cases to the home that can offer them the security they need to rebuild their lives. Many of the women at Sreepur are involved in the making of Sreepur Cards to raise money for Sreepur Village. Their involvement ranges from growing the jute, making and dying the paper, to creating the designs and packaging. As well as women from Sreepur Village being involved, there is an Outreach Project where women in the local community can earn money by making the card designs from home and delivering the finished cards once a week to Sreepur Village.